It is a real pleasure to work on…. You can feel that it is a Spanish blanket…you can carry to dance some Salsa!! Olllllllllé ! 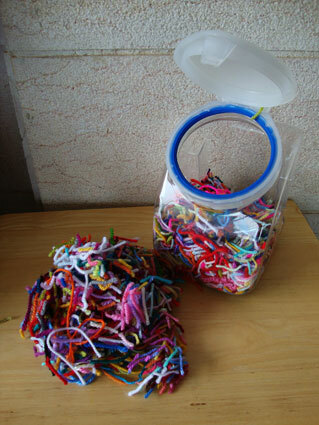 and in this one toooooooooooooooooooooooo………………………..
Before I go I want to show you my plastic box full of yarn ends…. So the good news is that on the beautiful blog of Elizabeth Cat she is gonna show us very soon how to make a heart with those cute little yarn ends 🙂 Thank you Elizabeth! The edge looks great too . 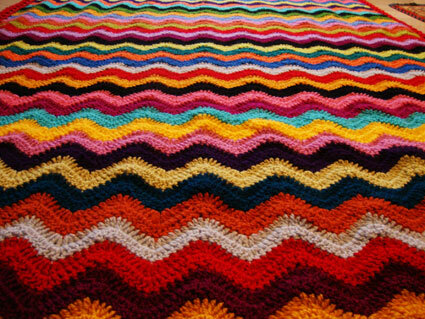 It’s truly a lovely blanket, Angie!! 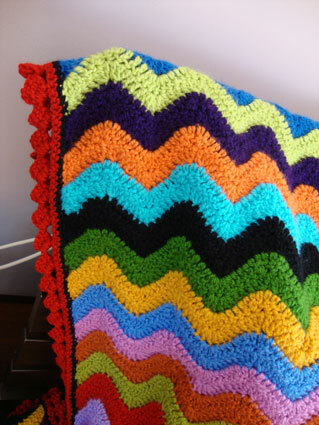 I love all the colors and the border, too! What are you going to be making next, I wonder? Can’t wait! Beautiful work – what an accomplishment! Love the edging! Who can realize something that keeps you at the same time warm and fresh ? 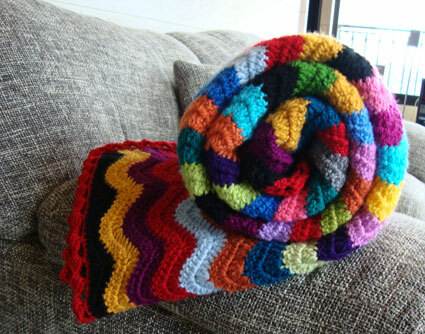 an olé blanket made by Sucrette ! Hello Angie! 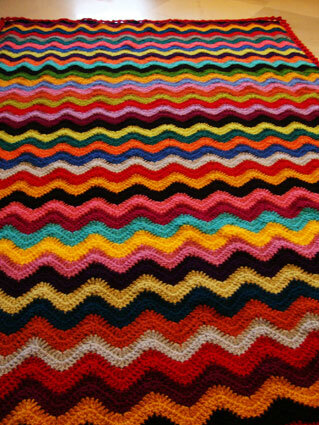 What a joyful blanket! It’s really beautiful! and I love the borders! Thank you for a lovely colourful start for Sunday! Hi! Your blanket is lovely!! Wow, I love It, I love it, I love it!!!!!! Elle est tout simplement superbe, j’adore la forme , la taille et la bordure… TOUT quoi … et le choix de la laine :-). Pourrais-tu faire un petit schéma du point de la couverture et de la bordure que tu proposes déjà. Merci d’avance. That’s a beautiful blanket and the name is very appropriate. 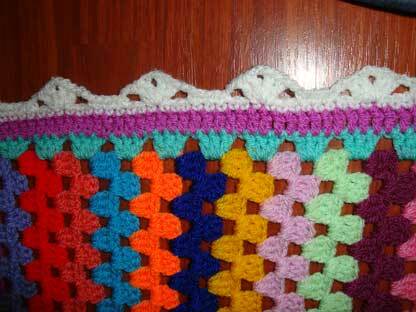 I quite like the simple edging too. Stunning!! 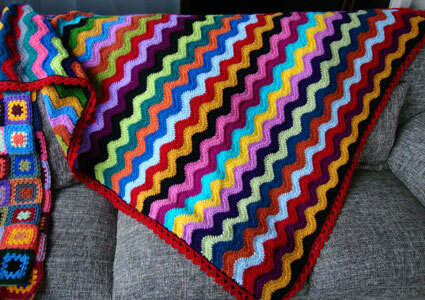 Angie, if I ever find the patience to make a blanket, I think something like this would be great for me to make. 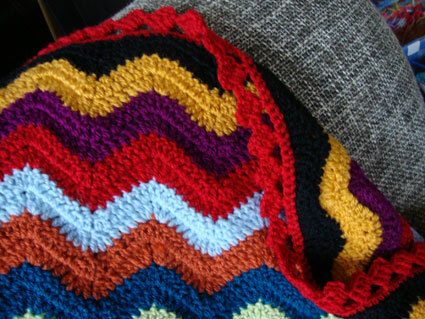 I like the ripple pattern a lot and I think for me it is better than squares. Love your colour choices! Love to see how you did the border, esp. on the ends! Looks wonderful! 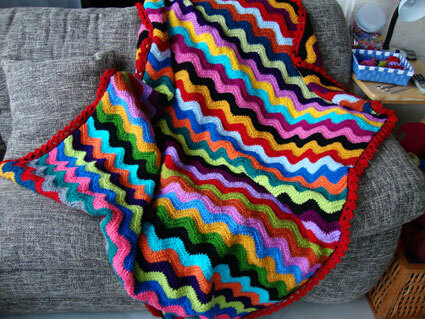 WOW…what a great Work of your Chrochet!!! Fantastic! 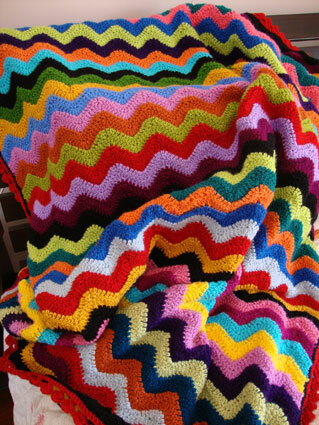 I love this Blanket and all this colourful and joyful Colours…very, very beautiful! 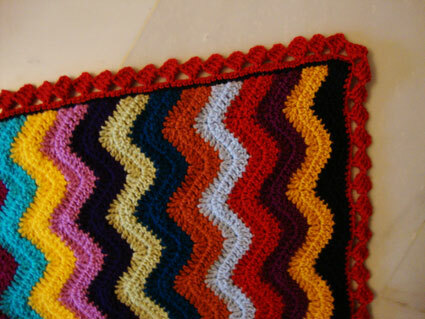 The Border also did a wonderful job and I would be glad if you write a grafic pattern for us…Thank you so much! I’m curious what comes next … and I’m looking forward. Your blog is so beautiful and happy! Aller et venir sur ton blog me ressource……..
Another lovely project finished, congrats!! 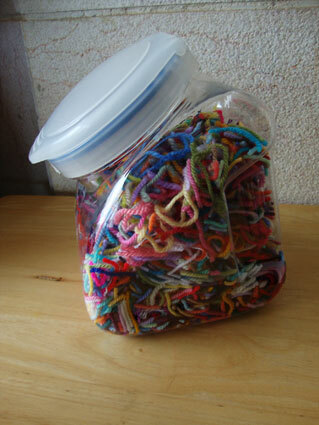 I just had to comment on your ‘jar of ends’. I too keep ends from every project, anything over about 4″ long. This is because one of my favourite things to make is a huge clown toy designed by Jean Greenhowe. His name is Godfrey Gadabout and he’s a tourist clown. Anyway, his scarf (gotta be prepared for cold as well as rain, sun etc LOL) is supposed to be a tatty, well worn one and as such it’s made from loose ends of yarn, all knotted together into a huge ball and then you knit with that!! I think it’s great cuz I generally only make the clowns for those that want the whole set (and by now there are a LOT of them 5 in the first book, 2 plus 2 postboxes in the 2nd book, 3 in the 3rd book, then a single golfer clown, a snowman clown and then another 5 child clowns in the latest one) so I do Godfrey last by which time there is a beautiful assortment of ends of yarn to knit with and that scarf is testiment to all the others that I’ve done in the series and I can have fun remembering making them while finishing the last in the set!! OOOh Paula I would love to see the clowns you make…they must be beautiful … Do you post the pics somewhere? 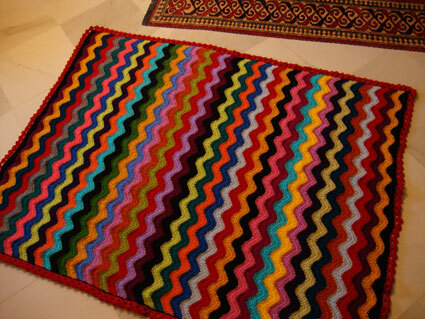 Your afghan is beautiful. Love all of the fun colors you used in it. wowie de powie! (try to prenounce that haha!) You are not only a cushion-make-factory but also very good in blankets!!! Super Angie! Love love love it! I love the result and all the ccolours! 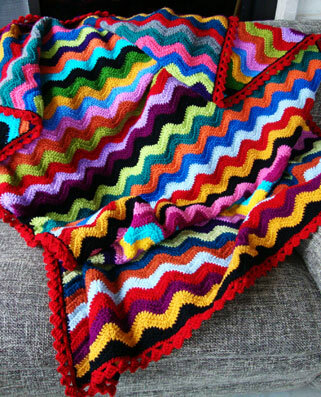 hi…..i am so excited to see your finished ole ole blanket….i really admire you skill at putting just the right colors together….that is always a challange for me……thank you for sharing your beautiful works with all of us….. I can’t wait to see how you did the border. PLEASE TELL! I have my own box full little yarn ends! Wow! It’s lovely – so warm looking! I love the colours! It’s so gorgeous! 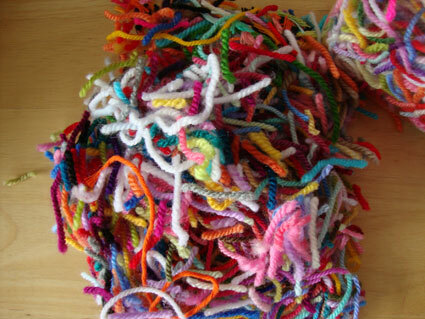 I like the idea of keeping those yarn ends…. I simply haven’t thought of doing that, i’ve just been throwing them away (or giving them to my daughter to play with but then they also just end up in the bin :)). Angie, this is lovely! Ole, ole, oleeeeeeee!!! Would be interested in having a diagram or something of the edge as it is very unusual and pretty. You are right – I want to wrap myself in it and dance!! 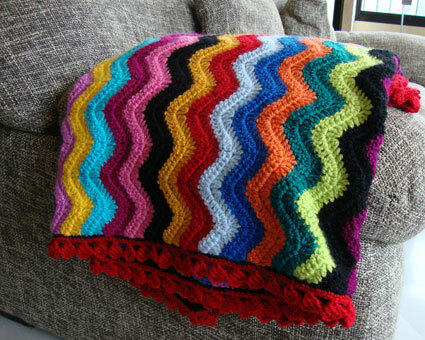 Would you please be willing to share the pattern for the blanket and the border as well. Thank you again for sharing your wonderful inspiring work. Beautiful – the colours are so vibrant and cheerful. Oh, thanks a lot!!!!!!!! It is very much helped!!! I even found their site. There is a large selection of yarns!!! You know I’m knitting for more than twenty years, but I never thought about knitting blanket… And now you inspired me to try this one!! I am very grateful to you for this! I’ll wait for your next creations!!! Lovely in every way. Wowee! i’m almost finished mine and it will be a sad affair too!